Door to door drop offs and pick ups in Banff. Drops offs and Pick ups in Canmore at major hotels along the Bow Valley Trail. 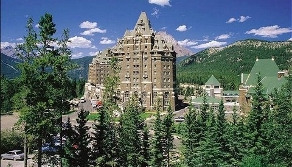 Reservations required for all Banff and Canmore pick ups and recommended for any scheduled transfers. Walk ons accommodated on a first come, first serve basis at the Calgary International Airport. Maps and information packages, free luggage storage and internet service available at the Banff Airporter Tour Desk, Area C, Main Arrivals Level, Calgary International Airport. Discounted fares for return tickets.Discounted fares for large conferences. Modern 13 passenger tour vans and 24 passenger tour buses with internal luggage storage and overhead luggage racks.